Ultra Soft Fan Gaskets are manufactured and supplied direct exclusively by Quiet PC LLP, telephone +44 (0)1653 668000. Not just 1mm thick like other fan gaskets - these are 2.5mm thick! Where can I buy Ultra Soft Fan Gaskets? These ultra-soft fan gaskets are designed to reduce the vibration from PC and server case cooling fans, and maintain a seal between the case side and the fan housing. 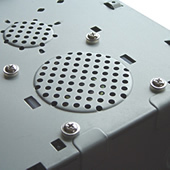 Each retail pack contains an anti-vibration fan gasket with 4 silicone washers and mounting screws. We believe they are the thickest and most effective available anywhere! Why are these silicone fan gaskets especially effective? 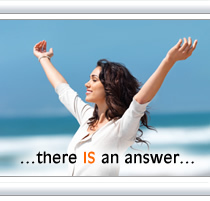 Because we have not held back on the silicone thickness and the silicone material softness. All gaskets are 2.5mm thick (not just 1mm like alternatives), and Shore A 25 (a great deal softer than others we have tested). We are confident that these two factors make these gaskets more effective than any other models available. The hardness testing of plastics and rubbers is most commonly measured by the Shore (Durometer) test or Rockwell hardness test. Both methods measure the resistance of plastics toward indentation and provide an empirical hardness value. Shore Hardness (using either the Shore A or Shore D scale), is the preferred method for rubbers/elastomers. The Shore A scale is used for 'softer' materials like silicone rubbers, while the Shore D scale is used for 'harder' materials. The Shore hardness is measured with an apparatus known as a Durometer and consequently is also known as 'Durometer hardness'. The hardness value is determined by the penetration of the Durometer indenter foot into the sample. A 'softer' material will have a lower Shore value than a 'harder' material. These gaskets are suitable for the vast majority of case designs and fan combinations, as they fit standard fan mounting holes. Slightly lengthened (12mm thread) fan mounting screws are supplied with the fan gaskets and washers. 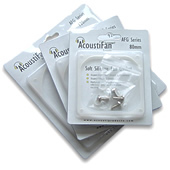 These gaskets can be used with standard PC cooling fans, and not just with AcoustiFan quiet case fans. Tighten the screws enough to very slightly compress the silicone rubber. Do not over-tighten. Please Note: Do not use these gaskets in very high temperature locations inside a PC/Server such as attached to a CPU cooler or GPU heat sinks! These gaskets are designed to be used against case side panels. "To efficiently test the AcoustiFan Anti-Vibration Silicone Fan Gaskets, we had tested the 80mm gasket on several different fans from the high CFM ones off Thermaltake heatsinks to some Cooler Master fans while the 120mm gasket was paired up with an 80CFM fan. Through using the single gasket and the silicone washers, we were incredibly impressed with the improved performance. In result of the Silicone Fan Gaskets a decrease in fan vibration/noise occurred, along with an increase in air efficiency. ... Although we were a bit skeptical at first, we were dumbfounded with how much of an improvement both of the items had made on our deafening computers. 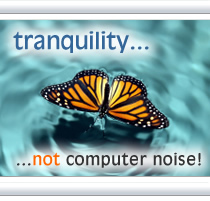 Costing only a few dollars from our friends at QuietPC, we see no reason not to recommend such wonderful products. "I tested the Soft Silicone Fan Gasket alongside a Vantec Vibration dampener.... the Acousti Products Gasket slightly out performed the Vantec due to the fact that it stopped internal vibrations more effectively. "I found the [80mm C-Series AcoustiFans] and the silicone gaskets work together very well to create an almost totally silent fan. I would recommend these fans and gaskets to someone looking to silence their PC a little more. "I fired up the PC with the [80mm C-Series AcoustiFan] fan installed in the rear, exhausting air out of the back. The fan itself is very quiet when running without the resistor. 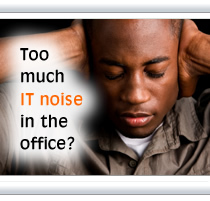 I had to get right against it with my ear to hear it, but I could hear the vibration noise with no problem. The next step was to apply the silicone gasket and included screws to the fan. After completing the install, I fried up the PC again. This time there was almost total silence. "Brilliant idea and actually makes a difference." Mike, UK. "I have mounted all my fans with these to get that optimal air flow for the water cooling system. Works a treat and no vibrations either. " John, UK. "Great product, definitely lowers vibrations." John, UK. "These are simply the best sound dampening gaskets on the market today. I have exclusively used them in the 80,90 and 120mm variations." Michael, Germany. "Very good product - does more than I expected for the sound level." Colin, UK. "This product certainly made my desktop PC much quieter, and given that it already had some quiet fans installed it was nothing short of amazing." Adam, UK. 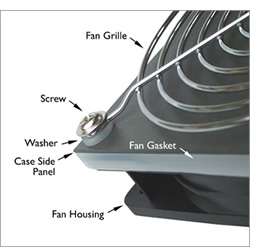 "I was looking for a cheap solution to my vibrating fans without changing them. This product reduced the vibration for a great price. I believe that there are plenty of customers like me out there, wanting less noise for an affordable price." Henrik, Sweden.